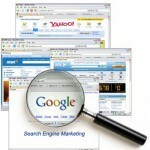 How to submit your website to search engines? As soon as the world stepped into the 21st century, the computer, technology, and Internet communcation started growing on a massive scale. There are people out here who know how to make a website and publish it online. But still there are millions who have no idea that how their website will get listed in well-known search engines like Google, Yahoo, MSN aka Live.com, Altavista, Ask, Dogpile, and many more. So here is a simple guide and links to help you out submitting your website to different main search engines. Author Talal MasoodPosted on November 10, 2008 Categories Computers, Google, How-To Guide, Internet, Microsoft, Search Engine, Yahoo!Tags Altavista, Ask, Dogpile, Doogate, Excite, Freefind, Gigablast, Google, Guruji, Hotbot, Live, Lycos, msn, Search Engine, seo, Submit URL, Yahoo!1 Comment on How to submit your website to search engines?